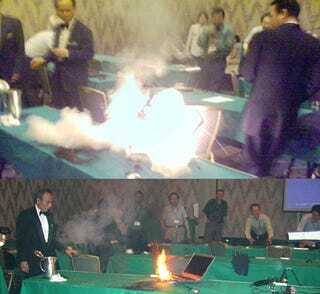 At a conference in Japan, a Dell laptop suddenly exploded into flames, and lucky for its owner the fiery blast occurred while the PC was sitting on a table and not in his lap. An onlooker reported that the notebook continued to burn, producing several more explosions over the course of about five minutes. The model of the offending Dell notebook wasn't mentioned, but since it was of the Windows persuasion, we can now boast that we are unbiased in our reports of fiery laptops, both Mac and PC. It's only a matter of time before something like this happens on an airplane.